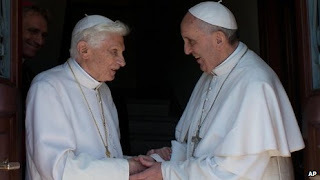 On Thursday May 2, 2013, Pope Emeritus Benedict XVI returned to the Vatican now that the restoration of the monastery he will be staying at has been completed. For the first time in history, there will be two living Popes in the Vatican, one reigning and one retired. Benedict XVI will be spending his retirement praying and studying. This is what he has always wanted to do even when Blessed John Paul II was Pope and he offered his resignation to him, but John Paul II refused it. He has vowed to be loyal to his successor who is now Pope Francis and has promised to work for the Church. He was greeted by the current Pontiff, Pope Francis at the entrance of the monastery. Both then went to the chapel to pray. I wish Pope Emeritus the best in his retirement years and hope he will continue writing books. He is the most intelligent and articulate theologian in modern times - a living doctor of the Church. Welcome back Pope Benedict XVI!